This award-winning D/B project partnered LANE, KCA, and DRMP for high-level bridge construction and demolition. The project consisted of demolishing the existing bridge and constructing a new 3,207-foot bridge. The work included reconstruction/realignment of the SR 406 roadway and bridge approaches. The new bridge has two 12-foot lanes, 8-foot outside shoulders, and 5-foot sidewalks in each direction. 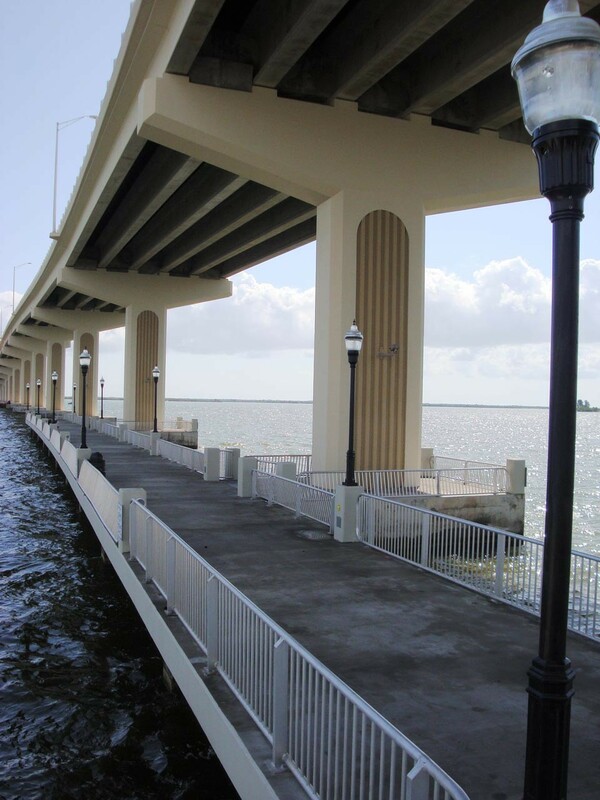 In addition, a new recreational fishing pier was constructed at the end of the west causeway and extends 300 feet into the river. The project also included accommodations for pedestrians and boat traffic at the boat ramps in the adjacent park. The new bridge was designed for ship impact loads. The project’s final CPPR grade was 100 and was awarded the 2011 FTBA Best in Construction Design-Build; 2012 DBIA Merit Award in the Transportation Category for the Florida Design-Build Awards; 2012 America’s Transportation Award: Best Use of Innovation, Medium Project Category.